Doug Drexler recently posted the raw graphic for this. Anything we hadn't already figured out? Well hey, if there were that many Excelsiors and Mirandas kicking around no reason the Constellation couldn't be too. Yes, particularly since the Federation wasn't doing too terribly well against the Dominion until the Romulans entered the war. It was probably another Wolf 359 scenario where they pulled a whole bunch of older ships out of mothballs just to set up a decent defense against a tactically superior force. This is further evidenced by the slapdash way certain odd looking ships were fielded in the DS9 frankenfleet. Constellations wouldn't be at all unusual to see out there. I don't see much difference between this list and the one used in the episode. The Okudagram I'd really like to see is the shiplist seen in "Measure of a Man." This graphic was first published in the DS9 companion, back in 2000 (time is fleeting!). Offtopic: Did anybody noticed this new Discovery promo for season 2, featuring the actor of Captain Pike? I don't want to spoiler you but you have to check out time code 1:21! My reaction was: Wow! Is it what I think it is? Yes, it’s two tugs tugging the Enterprise. Is that what you thought it was? I’ve often wondered how the same person could be reported both KIA and MIA from two different ships. 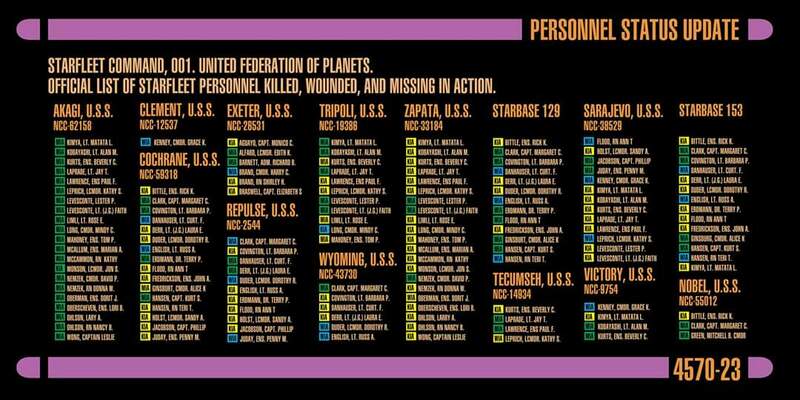 And also that 144 casualties in a week seems awfully low for a major interstellar war. That was page 1 of 34. They look more like the DSC version of the Ptolemy class tug. You are probably right. I didn't noticed the blue tractor beams before. The reason why I was so excited in the first place: The USS Enterprise looks very TOS-ish to me in this shot. Only later I realized that the warp nacelle pylons only look straigt, but they are not. Can't wait to see S2 next week! Easy, ran away from one ship only to get killed on the next one. Oh the irony.